As I drove to work Monday, the sound of chain saws running could be heard in nearly every direction across Galion. Even the neighborhoods least affected by the tornado Sunday evening still had limbs and other debris to clear from their property. Driving through town was a challenge. Many streets weren’t clear or were in the process of being cleared by numerous crews that descended upon Galion. There were numerous piles of trash that had been hauled out to the curb for pick up. There were roofs covered with tarps, and roofs that were in such bad shape that a tarp wouldn’t even help. There were cars crushed by fallen trees or limbs. 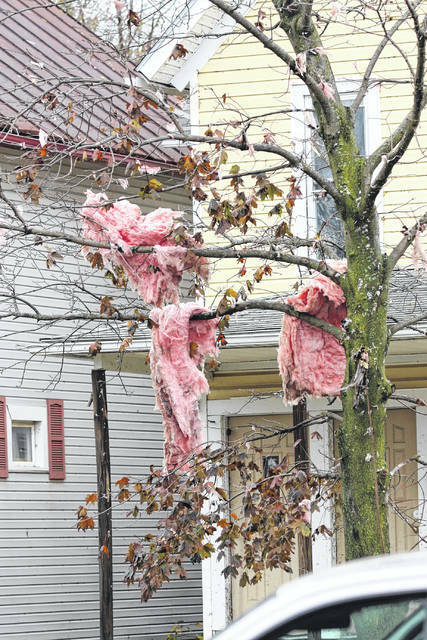 There was housing and commercial insulation hanging from trees. It was a sight you never hope to see anywhere, let alone in your town. When the tornado touched down north of Galion on Labor Day, I remember having that exact thought. As a reporter, I went up to the houses of complete strangers who were grieving and asked them to speak to me. I asked them about their experience. What did they hear? Did they have time to take shelter since there was no warning sirens? How much did they lose? These people were strangers, and it was almost unbearable for me. I listened to their pain, trauma, and grief. I saw people I never knew before cry right in front of me. Sunday night after the storm moved through Galion, I got to experience it all over again. The difference this time, was that I knew the victims. Long time friends lost the entire roof of their home. It’s very possible the only home their children have ever known will be a total loss. I walked inside their home and saw the rainwater pouring in. I saw their children’s toys thrown about getting wet and ruined. I watched my friend cry at the thought of it all, and I cried with her. I saw businesses trying to clean up from building damage and equipment loss they may never come back from. But what I also got to see, was hope. There were neighbors and family members helping and checking on each other. There were city utility and street crews working tirelessly to restore power to the darkness. Domino’s Pizza serving free slices of pizza and bottled water for lunch and dinner, and even delivering free pizzas to those who didn’t want to take time away from the work they needed to do. Cake & Icing baking donuts to be given away with the pizza. Secretaries at Galion City Schools offering to help find assistance for families in need. At a time of divisiveness in Galion, I saw community. And I am thankful for that as well. Pieces of insulation hang on a tree Monday morning on South Market Street. The tree came from a house that lost its roof during Sunday night’s tornado. Reach Erin Miller at emiller@aimmediamidwest.com or 419-468-1117, ext. 249.